Accountant at Chairs & Co. Accountant Jobs In Chairs & Co.
Computer knowledge – a very good knowledge of Microsoft office. القدرة على القيام بمهام متعددة في نفس الوقت دون فقدان التركيز. معرفة الكمبيوتر - معرفة جيدة جدا من مايكروسوفت أوفيس. WE MAKE CHAIRS! FROM INDUSTRIAL AND FORMAL CHAIRS TO CREATIVE AND FUN CHAIRS, WE ARE HERE TO DESIGN, PRODUCE AND SEAT. 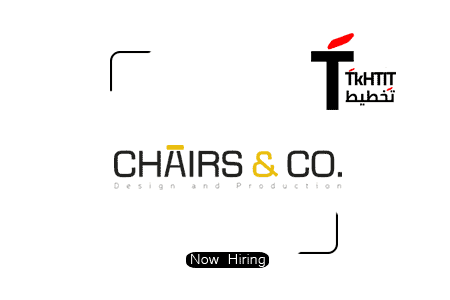 Chairs & Co. is a homegrown brand, specialized in the design and production of seating elements.A hub for two main lines, 'Canvas' and 'More'. Chairs & Co. manages to provide a variety in both form and function. 'Canvas', artfully fashions one-off, masterpiece chairs designed and made with the finest materials and attention to detail creating full furniture sets for homes, from living rooms, reception areas and dining rooms. Catering to companies and commercial projects 'More' provides economic chairs of both form and function. The line is made to order, specifically designed and tailored for commercial purposes to be provided in bulk quantities.